Browse > Home / Special Events / COMPLETED–Ven. LAMA JAMPA THAYE TEACHES AT EWAM CHODEN ON NOVEMBER 1-2, 2014 CLICK HERE for all information. COMPLETED–Ven. LAMA JAMPA THAYE TEACHES AT EWAM CHODEN ON NOVEMBER 1-2, 2014 CLICK HERE for all information. REQUESTED DONATION AMOUNT — $40 per day or $60 for both days. Pre-registration isn’t necessary, but please arrive prior to the starting time. 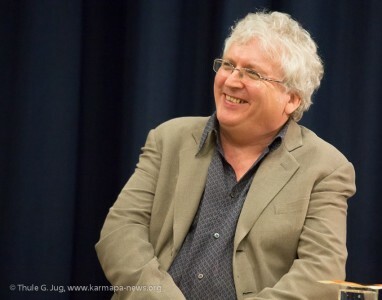 Lama Jampa has kindly offered to teach on the first two points of the Seven Point Mind Training, which includes the preliminaries and the actual practice of Tong-Len (གཏོང་ལེན་) (giving and taking ). He will teach from the untranslated commentary of Tokmé Zangpo, (ཐོགས་མེད་བཟང་པོ), who lived from 1297 to 1371. Training the Mind in Seven Points is the famous Lo-jong (mind-training) (བློ་སྦྱོང་) text that Atisha, (982–1054 CE), the Indian meditation master, brought to Tibet. An explanation of Buddha’s instructions on training the mind, it outlines in basic steps, the attitudes and practices to be used in daily life. It shows the way to combine ordinary behavior with the highest view. Lama Jampa Thaye is a scholar and meditation master trained in the Sakya and Kagyu traditions by his two principal teachers, His Holiness Sakya Trizin and Karma Thinley Rinpoche. Born in England in 1952, he became a student of Rinpoche at the age of 20 and met His Holiness a year later. 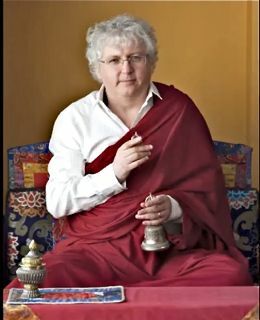 Lama Jampa obtained his PhD in Tibetan Buddhist history and served as Lecturer of Buddhist Studies and the History of Ideas for over twenty years at the University of Manchester. He was appointed by Karma Thinley Rinpoche as his dharma-regent in 1977 and given the authority to bestow Vajrayana initiations in 1988. Since then he has traveled extensively giving teachings and initiations and is the author of numerous books and dharma treatises. His many dharma activities include a YouTube channel where his teachings can be heard. The main website for his centers is www.dechen.org. When Lama Jampa visited Ewam Choden last year, he taught on the history of the Rime movement and on comparing the views of emptiness in Rangton and Shangton.